A suspicious package found near a West Midlands mosque was a small home-made explosive device, police have said. About 150 people were evacuated from homes around the mosque in Rutter Street, Walsall, after bomb disposal experts were called to the scene. The item was found on Friday evening but police were not called until it was taken inside by a member of the public on Saturday. Police said they were treating the incident as a hate crime. No threats were made to the mosque and police are “keeping options open”. 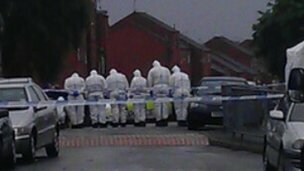 Supt Keith Fraser, from the West Midlands force, said detectives were pursuing a “number of lines of inquiry”. Police were initially called at about 22:45 BST on Saturday and the bomb squad ordered about 40 nearby homes to be evacuated early on Sunday. At about 07:30 BST police said people were being led from their homes in the Caldmore area and those who could not make other arrangements were taken to Walsall Town Hall. 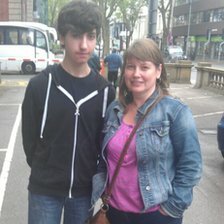 Linda Pepe and son Ricardo, who live on Rutter Street, said they were woken up by police at 06:00 BST. “This morning at 6am, there was a bang on the door like they were breaking it down and the police were there waiting,” Ms Pepe said. Speaking at a press conference at the scene, Zia ul-Haq, from the mosque, said the discovery was “totally out of the blue” and they did not know who could be behind it. He said: “We found a suspicious item which we did not consider to be serious but as a precaution we thought that we would call the police and bring this to their attention. “They have taken this very seriously and they have supported us whole-heartedly and we are very grateful to the police and the local authority. Some residents told the BBC they heard what sounded a like a firework go off near to the mosque on Friday evening. Mr Fraser said there had been some reports from the community that there were “things happening over the weekend” but asked anyone with information to contact police. Zahid Ali, cabinet member for public protection at the council, said it executed its emergency planning procedures once police were contacted. “We have taken the residents living within the immediate vicinity of the area into the council’s civic offices and premises.